"A basic responsibility of the community of higher education in the United States is to refine, extend, and transmit knowledge...law professors have a responsibility to engage in their own research and publish their conclusions. In this way, law professors participate in an intellectual exchange that tests and improves their knowledge of the field, to the ultimate benefit of their students, the profession and society." At the Fowler School of Law, we believe strongly in that goal and in those purposes behind our faculty's dedication to scholarship. 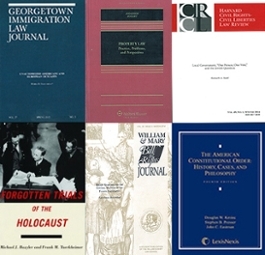 While you will learn about a variety of the activities of our faculty on other pages, including those most directly associated with other contributions to teaching and service, here we highlight some of the most recent scholarly publications of Chapman's law professors that complement those other duties.